Hi , we are Brad and Jody Williams. We have lived in the Mountain Home Ar. area for 31 years. We moved here from the St. Louis area to be by family and these beautiful lakes and rivers. Brad has been a custom home builder for the past 27 years. After living here a few years we knew the Ozarks was where we should be. We bought this property in Sept. 2015. It is just under 3 acres in size. We liked the property because 2 minutes in one direction is Mountain Home and 2 minutes in the other direction is beautiful Norfork lake .It is very convenient to lots of shopping, city park, movie theaters. It is just really convenient You have the best of both worlds at your finger tips. we also like the property for all the trees and shade it has to offer. Brad got the vision to build 4 really quaint cabins with unique qualities. 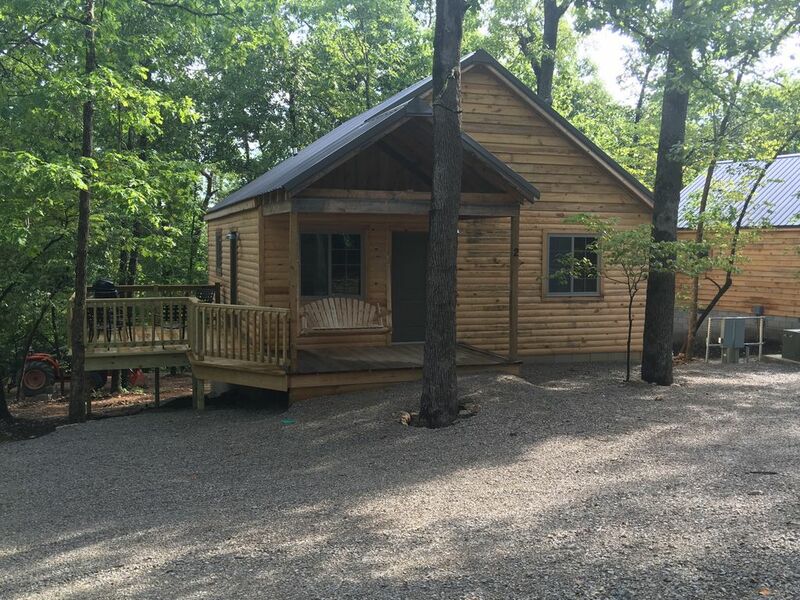 The cabins sit very nicely in a wooded area . The wood used in the finishing touches inside and out are native to the area. Brad pays very close attention to detail. This is what makes Fall creek Cabins a great vacation destination year after year. The bathroom has a walk in shower with a seat. The shower is made of cultured marble. Awesome location and a great cabin. These cabins are remarkable to say the least. The owners are very hospitable and they take very good care of their properties and guests. Some friend and I were in town for a race and stayed here for a couple night. Great cabins. New and well cared for. Everything you need. The next time we are back in Mountain Home, Fall Creek Cabins will be our first choice. I would gladly live in one permanently! Cabin was great, super clean and really cozy. This little cabin in the woods was perfect. Accommodations are outstanding..bed was super comfortable and clean. Loved watching the deer feed in the back..for the price I highly recommend staying here. MORE SAFE. WE ARE IN OUR 70's AND FALLING IS A REAL CONCERN WITH US. We usually stay with family when we go to Mountain Home. But our family was busy getting ready for a big wedding, so we needed to find a place to stay. We were so lucky to have come across these cabins! It was just as spacious and clean as the pictures portrayed. And for about the same as what the rest of our family paid for a cramped hotel room, we got an immaculate 2 bedroom cabin with lots of room to roam! We really thought it was brand new until I found a log book right before we left, where people have been writing about their stay for a while. My 7 year old twins were so excited to find a deck of cards in a basket in the living room and instead of playing on iPads or watching tv, we played card games and snuck to the back window to see the deer that fed out our back window. My kids have stars in their eyes when they talk about “our cabin”. Such a welcoming and homey place! And the most comfortable beds EVER!! We hope to come back soon! In Mountain Home you will find plenty of restaurants, shopping, movie theaters, and beautiful parks. The area offers three 18 hole golf courses. If wanting to leave the area for a day, Branson MO. is just a 90 minute drive.